Guests Need Good Signage // Most of the people that come to amusement parks come once in a while and so they require great signage to point them in the right direction. We have the same issue in churches … think about the level of signage that you’d be comfortable with and double it. It disappears to your people after 2-3 weeks but your first time guests appreciate it. Helping Families Win is a Winning Strategy // Amusement parks obsess about creating experiences that appeal to various members of the family … toddlers and moms looking for safe stuff … “intro roller-coasters” to ease the tweens into thrills … and the epic rides to push the limits for teens (& dads who think they are teens). How is our church providing the entire family a chance to engage? Always Something New // Let’s be honest … amusement parks stay mostly the same from year after year because they invest huge capital in rides that take a long time to pay off. However, every year they advertise the “latest and greatest” to get people to come back and give it a try again. How are we communicating what is “new” at our church to encourage people to come back and try us again? People are Looking for an Escape // Hundreds of millions of people want a break from their “normal lives” and want to be transported to somewhere magical. How does that reality impact us when we minister them in their “normal lives”? Parking is Important // Watch how amusement parks deal with parking and do likewise. It’s awe inspiring how smooth they make that process. There Needs to Be Stuff People Haven’t Done // It’s fascinating to watch the internal dynamics with people as they take on the “next ride challenge” … it gives them motivation to keep coming back and try more. More important than having things people can do … is having stuff people haven’t done. How can we provide leadership experiences for our people who have served in every role? Do we need to provide more challenging and varied spiritual development experiences to help people grow? Teens are Important // One way to look at amusement parks is as massive youth drop-in centers. A perfect environment designed to provide teens “freedom” to do what they want but enough “control and structure” to keep them focused on spending money. It’s a cornerstone market for amusement parks. When was the last time your senior leadership team talked about what’s happening in your student ministry? It’s a critically important part of the life of your church. Talk about them and structure ministry for them. You Need More Leaders // Amusement parks are crawling with people serving the public … everywhere you look there are team members working to make it a great experience for their guests. We need more volunteers to serve our guests and to provide a high level of experience for them. It takes more people than we think. My family and I went to an amusement park a few weeks ago. One of the main points that I noticed was the lack of enthusiasm with the staff towards customer service. The staff that were efficient, intentionally engaging with the customers and just plain having fun, made the whole ride experience better. We wanted to go on those rides again and again! On the other hand, the staff that looked bored and treated us (the customer) like we were an inconvenience, made the ride unpleasant and uncomfortable. Not to mention made us second guess their safety standards when they look like they really didn’t want to be there. Creating a welcoming, fun and engaging environment is key to amusement parks, and life in general. So true! Thanks for dropping by Linda! I know you serve on a Guest Services team … how do you ensure you keep yourself friendly every Sunday you serve? Every single person that walks through the doors has a story, and knowing that my smile might make a difference in the beginning of a new journey for them, keeps me motivated. 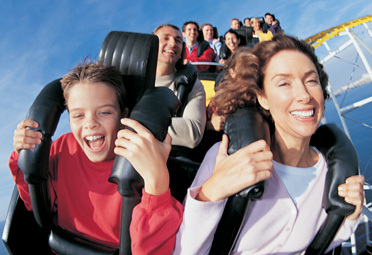 #10 Amusement Parks are Always more enjoyable when enjoyed with a group, family or friends. Same is true for the church. People need to be connected to others so they have someone to share the experience with… excitement, fun and fears. EXcellent piece, Rich. Loved it. Especially liked the reminder regarding finanances. They’re out there. We need to comfortably (and boldly) address it. I totally agree Gregg. I think if we project nerves and weirdness when we talk about money stuff our people will pick up on that. Thanks again for commenting! Have a great week!